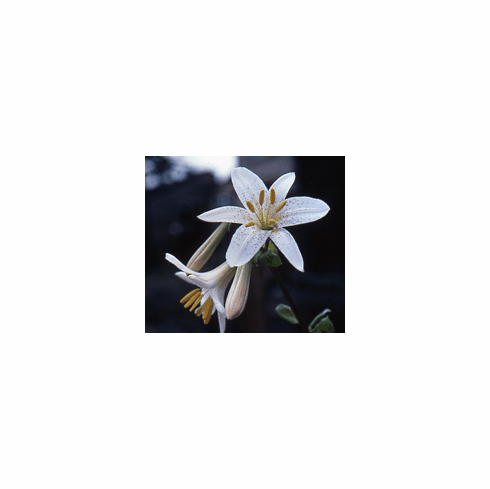 Named for Martha Washington, not for the State of Washington, Lilium washingtonianum and its variants enjoy a wide range. Found as far north as Mt. Hood, Oregon where locals call it the "Mount Hood Lily", but can be found far south as Yosemite. The pure white, trumpet-shaped flowers carry varying amounts of purple spots. As with Lilium rubescens, these blooms deepen in color with age to lavender. Near impossible to cultivate, it is commonly found growing in nothing more than gravel alongside logging roads. Long lived in the wild, bulbs can be covered by several feet of rubble spilling down rocky hillsides. Large photo is of a nursery grown plant. Inset #1 is a photo that was shot in the wild near Hood River, Oregon showing the deeper pink coloration of an aging flower. Insert #2 is of a studio shot by Edgar Kline of this difficult to grow species. Photo from the Bill & Marry Hoffman collection.